Well, I didn’t win. These people did. I'm not impressed with all of the winning shots, but some of them are indeed spectacular. No big deal. What is important is that I really enjoyed interacting with readers and friends, and getting some new perspective on my own photos. Also on the plus side, I've whittled down my photo collection to a few great shots, which I can continue to submit to other contests. I've already entered another contest on a friend's website. Thanks again to everyone who shared their views and helped me pick! The Centre Bethanie hotel sits on a peninsula which juts into Lake Kivu, on the Rwanda-Congo border. Back in 2004, I spent several days in Rwanda on my way to the eastern Democratic Republic of Congo. At that time—ten years after the genocide that left 800,000 dead and millions displaced—Rwanda was still very much a country on the mend, muddling forward with reconstruction. Last month, the country I found when I arrived there for a three-week work trip, while recognizable, was clearly much evolved. This was The New Rwanda. "Now as we begin our descent into Kigali I'd like to take the time to remind all passengers who will be disembarking here to remove any plastic bags from their luggage, to comply with Rwandan law." Some tourists chuckled at the flight attendant's warning, disbelieving. But a friend had alerted me before my trip, and I knew it was no joke. In the environmentally conscious New Rwanda, plastic shopping bags are illegal. The polls have closed, and the votes, comments, and emails of nearly 50 readers have been tallied. Thank you so much to everyone who took the time to consider the photographs and share your opinions! This process has helped me see these images in new and very different ways. Photo number 1, "The Anthill Lookout" from northern Uganda is the clear favorite, with "Boy at the medersa pool" not far behind, followed closely by "Hammocks in a blue wood". Nat'l Geographic Photo Contest: Help Me Pick A Winner! If you're reading this, I need your help! National Geographic Traveler magazine's fourth annual "World In Focus" photography contest ends later this month, and I've decided (perhaps foolishly) that I must take part! After years of traveling, and over 20,000 photos snapped around Africa, Europe, the Middle East, and North America, surely one of them must be of National Geographic caliber, right? Think of NG's majestic cranes, the docks fading into the mist, brightly painted Saharan warriors, polar bears duelling on the sea ice, the piercing stare of the Afghan girl... or better yet, check out the contest winners from the last few years. Hating Hijabs or Badgering Blondes: What's the Difference? Last night around 9:00 PM, I was walking home in the dark from a function near my office. After a long day at work, I felt like a rubber band that had been stretched too many times. I had just reached Dupont Circle, a small park in central Washington, DC, when a wild yell snapped me from my daze. Ahead of me, on one of the wide paths leading to the circle's central fountain, a small pack of teenagers were cackling and swerving menacingly around a man and woman. At a glance, I noticed two things: the couple looked to be around 60 years old, and the woman wore a long dress and hijab (the traditional Muslim head scarf). The 2010 World Cup in South Africa has come and gone. I did not reach Africa's first World Cup, although I did my best to watch every game (and for the first few weeks, before returning to a desk job here in Washington, I came close to doing so). Watching this Cup here in the US was nothing like back in 2006, when each muggy evening I crowded with fellow spectators around the TV in a ramshackle Tanzanian bar. The contrast is unmistakable; while the rest of the planet takes a month-long break every four years for the World Cup, few Americans even bat an eyelash. If anything, most marvel at the silliness of their fellow Earthlings' football fever. At 828 meters (2,171 feet), the Burj Khalif is the world's tallest building, and far too large to fit in a single frame. Many people who know me assume that I would accept any free ticket, that I would jump on a train or plane to any destination, all without thinking twice. Not so. On my unofficial List of Places I Never Want to Go, Dubai held second place for years. (Nothing could be worse than Vegas.) Everything I had heard made me want to avoid ultra-artificial Dubai: the excesses of the city's buildings, the commercialism of the malls, the environmental degradation from golf courses and ski slopes built in the desert, and the exploitation of immigrant laborers by the locals—a disdainful upper caste of billionaire oil barons. Yet like it or not, Dubai was the transit point for my recent trip to Iraq. After a mildly excruciating thirteen-hour direct flight from Washington, DC, we reached Dubai in the evening. Before landing, the plane arced above the city-state's towering downtown skyscrapers. In Baghdad's Green Zone, an Iraqi flag and military-themed murals adorn a blast wall. A week after I returned home from Iraq, I read about a recent survey examining quality of life in cities around the world. I tracked down the report, resigned to what I would find. Sure enough, Baghdad was dead last—planet Earth's least livable city. That Iraq has a long way to go before it attains a livable measure of stability is undeniable. After years of hearing (read: tuning out) stories of the atrocities which Baghdad's residents suffer every day, I found that conditions in the city were even worse than I had expected. Nonetheless, the Iraqis I interviewed, or those with whom I worked, were coping. After seven years of tragedies, what else was there to do but head out to work, to school, or to the market each morning and hope for the best? Viewed from the citadel, locals take an evening stroll in one of Erbil's central squares. The highlight of my trip to Iraq was the five days I spent in the northern region of Kurdistan—not least because it finally offered a chance to escape the prison-like compound in Baghdad. Along with one colleague and one security guard, I flew on Iraqi Airways from Baghdad to Erbil, the administrative and commercial capital of Iraqi Kurdistan. "Kurdistan" itself is something of an imagined land, since the ethnic Kurds straddle the mountainous borderlands of northern Iraq, eastern Turkey, northern Syria, and northwest Iran. History never granted the Kurds their own country, but today they are working hard to carve something like a nation out of Iraq—and to distance themselves from their Arab countrymen. Attending a meeting in Baghdad requires a unique wardrobe. The company compound where I stayed during my time in Baghdad was really nothing more than a few city blocks beside the Tigris River enclosed by high blast walls. The neighborhood was once prime real estate, however—just up the river is the former epicenter of Saddam Hussein's regime. Today that area is the International Zone (formerly known as the Green Zone). Given its prime position, the neighborhood was previously home to some of Saddam's closest cronies. His wife and other family members owned many of the houses in the area, as well as the mosquito-infested swampland leading to the river. Our security guards swore to me that Chemical Ali used to live in the villa facing the one where I slept. The Swords of Qadisiyah are just one of several garish monuments erected by Saddam Hussein in what is now the "Green Zone." But my neighbor volunteered some information on his own. After connecting through Dubai and Baghdad, he said, it would take him four full days of further travel—on progressively smaller planes and ground transport—to reach his unnamed outpost somewhere deep in the deserts of southern Iraq. Bed, Bath & Beyond is where I spend my days. Since returning in late February from our latest travels, Jacqueline and I have gotten busy reintegrating ourselves into normal American life. Craigslisting, job hunting, traipsing through the rain to visit apartments, purchasing cell phone plans, and shopping for home goods felt like familiar processes, albeit a bit surreal. A cat perches on a cold, wet roof in the old city of Fes. My post "Water, Water Everywhere, No Time to Stop and Think" has been re-published on the Matador Abroad travel site. The piece, which I consider one of my best from my time in Morocco, details the peculiar events of one very culturally enlightening weekend I spent in Fes, soon after my arrival in Fall 2008. I sent in the piece several weeks ago in response to a call for submissions, and was happy to hear that it was published today, accompanied by several of my photos. While the editor added a new title ("One Frenzied Weekend in Fes") and shaved off my sly Casablanca reference in the last line, I'm very happy to see my writing reach a larger audience! Cattle herders walk the roadside near the town of Bahir Dar. Amid the office towers of downtown Addis Ababa is a massive expanse of macadam—Meskel Square. The square, formed by the intersection of 12 boulevards, resembles a colossal mall parking lot, and is the heart of Ethiopia's highway network. From this hub, the country's roads extends outward in all directions, deteriorating gradually as they grow further from the capital. Paved roads peter out and dissolve—first to gravel, then to rutted dirt tracks. Outside of Addis, many of these roads were too bumpy to allow for reading, much less writing. Snapping pictures or chatting occupied a few minutes, but mostly Jacqueline and I stared out the window, watching scenery for eight hours a day. The Ethiopian dish yedoro firfir is made with injera, chicken, hard-boiled egg, and lots of spices. Last month, having finally reached Ethiopia myself, I dove enthusiastically into an exploration of the local cuisine. Jacqueline followed timidly at first, but by the end of our trip had developed a healthy appreciation for her own favorite dishes (particularly bozena shiro, goat meat in a rich spicy sauce). What follows are some of my observations on the country's very unique food and drink. Though geographically landlocked, culturally speaking Ethiopia is an island, distinguished from its neighbors by its unique history, ethnicities, cuisine, calendar, and most of all by its language. Amharic, the mother tongue of the Amhara (Ethiopia's dominant ethnic group) and official language of the country, is central Ethiopia's uniqueness. Though technically a Semitic language (and thus distantly related to Arabic, Aramaic, and Hebrew), Amharic seemed to me to share few roots or words in common with those languages. Now that Jacqueline and I are back home in the Land of Internet, I've been able to sort through and upload photos for all my previous entries on our Ethiopia trip. There is little more than an occasional camel caravan on the road from Kombolcha. I was glad not to have to travel it twice. The passport, it turned out, was in a hotel room back in Kombolcha, a long day's drive northeast of Addis. Reached on the phone, the hotel manager there promised to hand it off to a driver who was heading this way, and told me to sit tight. So I sat. I sat for a whole day in the lobby of our hostel on Mundy Street. The trip from Lalibela to Ethiopia's capital took two days of driving rough roads through scenic countryside. From Lalibela we drove a day to the town of Kombolcha, from where it took the better part of another full day to reach Addis Ababa. Our northern road trip was over, and it was time for Jacqueline and I to decide on our next move. The plan, of course, was to continue south overland, to Kenya and beyond. But since our arrival in Ethiopia, Jacqueline's desire to travel had been rapidly waning, due to a perfect storm of factors. First, Ethiopia had racked up quite a few strikes in her book: the fleas, the higher-than-expected costs, the unfamiliar and unvarying food, the shoddy hotels, and the long rides on rough roads. Early morning worshipers overflow the dawn service at the Church of St. George, one of Lalibela's spectacular rock-hewn churches. The Seven Olives Hotel rests on a hillside overlooking the town of Lalibela, in north-central Ethiopia. Jacqueline parked herself there for two days, relaxing and reading on the terrace beside our room, taking three meals a day at the restaurant, and generally trying to forget about her long ordeal with the fleas. Having sworn off all further visits to Ethiopian monasteries, churches, chapels, and cathedrals, she stayed behind each morning when I set out to explore Lalibela's main attraction: the famous rock-hewn churches. Making snap decisions in a foreign environment is challenging, especially early on, when one is unaccustomed to the rules and particularities of a new destination. For our first two weeks in Ethiopia, Jacqueline and I kept looking back at decisions we had just made, and wondering "How could we be so stupid?" At every turn—whether with hotels, transport, meals, or anything else—we seemed to choose wrong. Our misadventures in the Simien Mountains were the icing on the cake, and in the aftermath, our spirits were low. Recognizing that Jacqueline was near the end of her rope, I finally made a good decision: I proposed we take a day in Gondar to recuperate (and to coat everything Jacqueline owns in flea powder, which we finally found at a local pesticide store). After the flea treatment, a shower, a night's rest, and several nice meals, I was able to coax Jacqueline into continuing to the final destination on our northern Ethiopian road trip—Lalibela. It proved, against all odds, to be another great decision. The full story on Lalibela is coming up next! An alpha male Gelada baboon patrols the perimeter of his troop's grazing area. The ridiculous packing process was soon bested by a yet more absurd scene: the two clients carrying bags (Jacqueline had our daypack with lunch and water, and I my trekking backpack) and traipsing off down the road, accompanied by a small army of locals who, despite ostensibly being paid to help us, walked empty-handed. We soon turned off the road, following a path along a massive vertical escarpment. For the next several hours, the sheer dropoff loomed to our left. Behind it, a dramatic view of the mountains floated in the midday haze. For Jacqueline and I, the uphill sections—even small ones—proved brutal; the altitude was definitely a factor on this trek. Short of breath, our mouths dry, we guzzled water like parched dogs, and eagerly seized every opportunity for a break. Nobody ever called Scout anything but "Scout." But even in the absence of a name, he proved himself quite a character. Gondar, the northern town that was Ethiopia's capital in medieval times, still boasts a series of imperial castles that look like they were lifted straight out of old Europe. But Jacqueline and I weren't here for sightseeing—Gondar was our jumping off point for a multi-day hike in the Simien Mountains, several hours' drive north along a rough gravel road. Along that route, we passed the village of Wolleka—the former home of Ethiopia's once sizeable Jewish community (known as the Falasha)—and then mile after mile of the same Ethiopian farmland that we've been driving through for several days now. One of Awuramba's residents weaves a blanket on a traditional loom. One of the more interesting points of our road trip so far was a trip Jacqueline and I made on a whim to the peculiar little village of Awuramba. Back in Bahir Dar, a friendly Australian lady urged us to make an extra stop on our drive northward, at a small village that produced excellent woven products, but whose name she couldn't recall. We communicatd her directions and description to our driver, Yoseph, who knew the place immediately: "Ahh, you mean Awuramba." We arrived a few hours later, and found much more than a mere weaving village. Yoseph parked our Land Cruiser in the center of the village, under a large tree surrounded by simple huts, with goats and chickens picking over the grounds. A tour guide quickly materialized and, in very rough English, set about explaining the village's history and organizing principles. Murals in the Ura Kidane Meret monastery depict scenes from both the Western and Ethiopian Orthodox Bibles. Our northward drive continued Monday to the city of Bahir Dar, which we reached in time for lunch. Bahir Dar sits on the edge of Lake Tana, and is generously characterized as "Ethiopia's Riviera", though it seemed a bit more rough around the edges than some other rivieras I've seen. We pitched our tent on the grounds of the Ghion Hotel, beside the lakeshore, and spent the afternoon relaxing and watching the birds (an eclectic mix of parakeets, vultures, pelicans, hornbills, seagulls, fish eagles, pigeons, and plume-tailed songbirds) clatter through the treetops. Just north of Addis, cyclists and Ethiopia's famous long distance runners trained along the road's edge. The Abeba Tours manager and driver picked Jacqueline and I up at our guest house in Addis early Sunday morning for the start of our two-week northern road trip. As the churches emptied out from their all-night services, white-veiled figures filled the otherwise deserted streets. We left the city's northern limits, cruising along a well-paved road that brought us abruptly from the metropolis to rolling farmland. Runners and pods of bikers chugged along the roadside; our driver, Yoseph, told us that Ethiopia's most famous athletes, including the internationally renowned marathoners, train along this stretch of road. At least this internet cafe in Bahir Dar had some nice flowers outside, which I could look at while waiting for my email to load. Truer words were never spoken. Just wish I'd read them before I arrived! Debebe shows me the Holy Trinity Cathedral in downtown Addis Ababa. Next time we'll make sure not to visit Addis Ababa during an African Union summit. Our first three days in Ethiopia's capital have been dominated by the presence of several hundred dipomats and heads of state from around the continent. Roads are blocked, hotels are full, and ATMs are tapped. The upside is increased security: a policeman or soldier with an AK-47 is stationed every 50 feet along each side of every street in the city, ushering along the VIP motorcades and civilian traffic. Despite the unexpected disruptions posed by the conference (which apparently occurs here three times per year), Jacqueline and I got off to a great start in Addis. Our first cab ride was fortuitous; we found a very friendly, English-speaking driver named Debebe, who was happy to be paid to tote us around the city for an afternoon. Last Tuesday, Jacqueline and I were in the thick of our planning for our upcoming trip to East Africa, when the earth beneath Haiti trembled, swallowing up much of what little hope existed there. In the days since the earthquake, I have been closely reading the accounts emerging from Port-au-Prince and the surrounding countryside, plus the development blog chatter about the quake's aftermath and its implications for Haiti's future. Soon after the earthquake, Jacqueline and I began to wonder if we were doing the right thing. Shouldn't we scrap our East Africa trip plans to go volunteer in the rebuilding effort? As I read more, however, I realized that assisting on the ground wasn't even a realistic possibility, and might not be for some time, due to the almost complete collapse of Haiti's already minimal infrastructure. 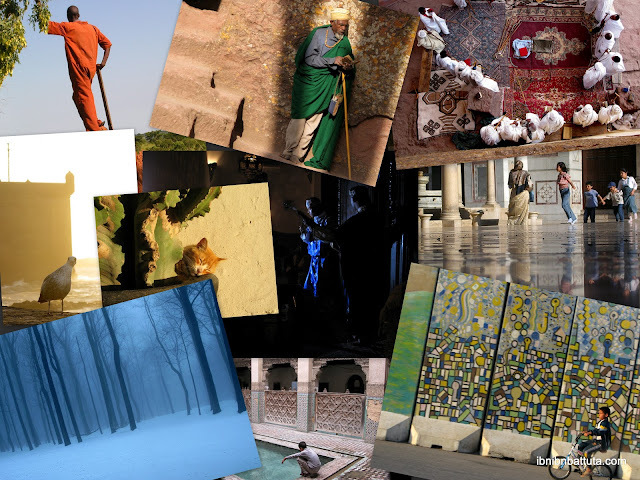 Best of Morocco Blog Awards: Vote for Ibn Ibn Battuta! Excitement! Ibn Ibn Battuta has been nominated for the "Best of Morocco Blogs" in the "Overall" category! Go to moroccoblogs.com to cast your vote (it's super quick—no registration required). While you're there, help out Jacqueline, whose blog Vie au Maroc was nominated in the "Personal Blog" category. Thanks for the support! A biker speeds through Marrakech's covered souq. Now, the moment you've all been waiting for. No more landscapes, snake charmers, or chickens. These are the iconic images that define Morocco: its walled cities, ornate medersas, soaring mosques, and open-air houses. Animals are some of my favorite subjects. Though they don't sit quite as still as buildings, they're nonetheless far easier to shoot than humans. As living, breathing beings, animals often give viewers the same sense of warmth that a photo of a person can give. In addition, animals are wonderful subjects for travel photography, because they can lend a photograph such a vivid sense of place. To most viewers, no image evokes the Middle East as immediately as that of a camel. Show us a kangaroo and we think Australia, a lion East Africa, or a bison the plains of North America. A student checks his sideburns in his room at the Medersa es-Sahrij, a religious school in Fes. The best and most iconic travel photographs almost always capture humanity in a striking way. That's because people—and the interactions we have with each other—are the most interesting aspect of travel. Capturing people, their emotions, and their stories through photography is no small feat. And unfortunately, it's not my strong suit. Perhaps after too many awkward incidents in the Middle East (a region where shutter-happy Western tourists are frequently viewed with suspicion, if not downright animosity) I now hesitate to shamelessly approach people and ask to snap their picture. It's something I'm working on, and in the meantime, I'm perfecting the art of shooting indiscreetly from the hip. Near Essaouira, a farmer and beast of burden head home for the evening. Exploring Morocco's countryside, its coasts and mountains, ranked among my most enjoyable experiences during our time in the country. In contrast to its reputation, the northwest corner of Africa isn't all desert. (And in fact, much to my regret, in 15 months I never even managed to visit the Sahara, or many of the sites in Morocco's arid south). But the country's rugged mountain ranges and miles of undeveloped coastline alone make it worth the visit. Dessert at Fes et Gestes salon de thé: sliced oranges with a hint of cinnamon. I sought out the technically stronger photos, the aesthetically pleasing ones, and those that seemed to convey a sense of the place—after all, such is what distinguishes "travel photography" from plain old "photography". After hours of brooding over my selection, I managed to narrow down the list to 75 photos that I consider to be the best from our time in Morocco. Update: All four collections are now posted. I'll leave it to you to decide whether I followed my own advice on travel photography. See Urban Scenes, Rural Scenes, Animals, and People. At the Medersa es-Sahrij in Fes, Morocco, my friend Ryan leans in for a water shot. Back in DC, on a balmy Saturday afternoon in the spring of 2005, I was strolling around Dupont Circle (probably trying to avoid studying for finals). Then a sophomore at Georgetown, I would soon be heading off for Syria and Jordan. So, I stopped into Claude Taylor's travel photography shop to browse for inspiration among his vivid photos. Inside, in the chair beside the usual cashier, sat the man himself. I perused the stacks, picked out a photo or two, and struck up a conversation with Taylor as I made my purchase. I explained my travel plans, and asked him, did he have any photography tips? (With no fancy camera or training of any sort, I figured I could use all the help I could get.) His answer was brief and immediate: "The two most important things you can do to take better pictures," he said, "are to get closer to whatever you're photographing, and to take more pictures." In addition to RSS, Facebook, and e-mail, you can now follow Ibn Ibn Battuta on Twitter! Follow @IbnIbnBattuta to make sure you don't miss any of the adventures—and please, pass the word along! It's 2010, and Ibn Ibn Battuta is still going strong. However, it's high time for some much-needed design upgrades. I've made a few tweaks to the blog's look already, as you can see on the homepage. To streamline things further, I'll be introducing a few more changes over the coming weeks... then it's off to Ethiopia!